The “Berserk” was overloaded to the point of being unsafe, Stuff.co.nz reports. Berserk leader Jarle Andhoy, 34, and Samuel Massie Ulvolden, 18, were attempting to reach the South Pole to mark the centenary of Norwegian Roald Amundsen’s South Pole expedition. The three left on the yacht were Robert Skaanes, 34, Tom Gisle Bellika, 36, and South African Leonard Banks, 32. Andhoy, a television celebrity in Norway, was fined recently for “trying to talk to the polar bears”. Canadian authorities arrested him on suspicion of being a member of the Hell’s Angels and deported him. Auckland commercial skipper Kevin Peat saw Berserk at the Viaduct. “They had all the stuff sitting on the dock and we thought there was no way they could get it onto the boat, but, over a two week period they slowly, but surely, lifted the gear into the boat,” Peat said. “We thought it was a joke, no way you would go with all that gear out it onto the ocean, certainly not the Southern Ocean.” It included 44 gallon drums of fuel lashed to the deck, along with quad bikes. One bike was lashed over the engine room hatch. Berserk was structurally sound but all the weight would have compromised its righting moment, meaning the boat would be vulnerable to capsize. He said it would have cleared Customs but as a foreign flagged vessel, it could not be prevented from sailing, even though it was unsafe. ICE BREAK HALTS AIRLIFT Meanwhile, an American bid to get as many people back to New Zealand from McMurdo Sound and Scott Base today has run into trouble as the sea ice which holds the runways breaks away from land. The US Antarctic Programme has already moved its 500 people out of quake-struck Christchurch and was last night and today sending two giant US Air Force Globemasters south to bring out several hundred people early before winter. If successful, they will be flown to Auckland from Christchurch today in an RNZAF airlift. Scott Base manager Troy Beaumont told the Sunday Star-Times that the sea was opening up and access to the ice shelf was becoming difficult. “The ice is breaking up,” he said. He said it was likely the Globemasters would be able to land at this point, but it would take staff longer to get onto the ice. Antarctic New Zealand CEO Lou Sanson said they had run into complications now that the Ross Sea Ice Shelf was parting from Ross Island. “We are seeing the biggest ever break out of the Ross Ice shelf in 15 years, our supply lines to the airfield are getting affected,” he told Radio New Zealand. The Prirazlomnaya oil platform was brought to the Arctic seaport of Murmansk, 906 miles north of Moscow, to be adjusted. Russia, where onshore oil reserves are slowly dwindling, last month signed an Arctic exploration deal with the British petroleum giant BP, whose offshore drilling prospects in the United States were dimmed by the Gulf of Mexico disaster last year. Other Western oil companies, recognizing Moscow’s openness to new ocean drilling, are now having similar discussions with Russia. New oil from Russia could prove vital to world supplies in coming decades, now that it has surpassed Saudi Arabia as the world’s biggest oil producer, and as long as global demand for oil continues to rise. But as the offshore Russian efforts proceed, the oil companies will be venturing where other big countries ringing the Arctic Ocean — most notably the United States and Canada — have been wary of letting oil field development proceed, for both safety and environmental reasons. After the BP accident in the gulf last year highlighted the consequences of a catastrophic ocean spill, American and Canadian regulators focused on the special challenges in the Arctic. 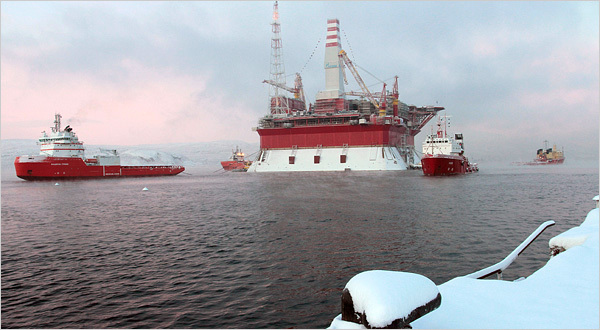 The ice pack and icebergs pose various threats to drilling rigs and crews. And if oil were spilled in the winter, cleanup would take place in the total darkness that engulfs the region during those months. Earlier this month, Royal Dutch Shell postponed plans for drilling off Alaska’s Arctic coast, as the company continued to face hurdles from wary Washington regulators. The Russians, who control far more prospective drilling area in the Arctic Ocean than the United States and Canada combined, take a far different view. As its Siberian oil fields mature, daily output in Russia, without new development, could be reduced by nearly a million barrels by the year 2035, according to the International Energy Agency. With its economy dependent on oil and gas, which make up about 60 percent of all exports, Russia sees little choice but to go offshore — using foreign partners to provide expertise and share the billions of dollars in development costs. And if anything, the gulf disaster encouraged Russia to push ahead with BP as its first partner. In the view of Russia’s prime minister, Vladimir V. Putin, BP is the safest company to hire for offshore work today, having learned its lesson in the gulf. “One beaten man is worth two unbeaten men,” Mr. Putin said, citing a Russian proverb, after BP signed its Arctic deal with Rosneft, the Russian state-owned oil company. The joint venture calls for the companies to explore three sections in the Kara Sea, an icebound coastal backwater north of central Russia. The BP agreement touched off little public reaction in Russia, in part because the environmental movement is weak but also because opposition politicians have no way to block or hinder the process. The Arctic holds one-fifth of the world’s undiscovered, recoverable oil and natural gas, the United States Geological Survey estimates. According to a 2009 report by the Energy Department, 43 of the 61 significant Arctic oil and gas fields are in Russia. The Russian side of the Arctic is particularly rich in natural gas, while the North American side is richer in oil. While the United States and Canada balk, other countries are clearing Arctic space for the industry. Norway, which last year settled a territorial dispute with Russia, is preparing to open new Arctic areas for drilling. Last year Greenland, which became semi-autonomous from Denmark in 2009, allowed Cairn Energy to do some preliminary drilling. Cairn, a Scottish company, is planning four more wells this year, while Exxon Mobil, Chevron and Shell are also expected to drill in the area over the next few years. But of the five countries with Arctic Ocean coastline, Russia has the most at stake in exploring and developing the region. Following the template of the BP deal, Rosneft is negotiating joint venture agreements with other major oil companies shut out of North America and intent on exploring the Arctic continental shelf off Russia’s northern coast. That includes Shell, its chief executive said last month. Rosneft’s chief executive, Eduard Y. Khudainatov, said other foreign oil company representatives were lining up outside his office these days. Artur N. Chilingarov, a polar explorer, has embodied Moscow’s sweeping Arctic ambitions ever since he rode in a minisubmarine and placed a Russian flag on the bottom of the ocean under the North Pole, claiming it for Russia, in a 2007 expedition. Russia has been a dominant Arctic oil power since the Soviet Union began making important discoveries in the land-based Tazovskoye field on the shore of the Ob Bay in Siberia in 1962. The United States was not far behind with the discovery of the shallow-water Prudhoe Bay field in Alaska five years later. What is new is the move offshore. The waters of the Arctic are particularly perilous for drilling because of the extreme cold, long periods of darkness, dense fogs and hurricane-strength winds. Pervasive ice cover for eight to nine months out of the year can block relief ships in case of a blowout. And, as environmentalists note, whales, polar bears and other species depend on the region’s fragile habitats. Such concerns have blocked new drilling in Alaska’s Arctic waters since 2003, despite a steep decline in oil production in the state and intensive lobbying by oil companies. In Canada, Arctic offshore drilling is delayed as the National Energy Board is reviewing its regulations after the gulf spill. 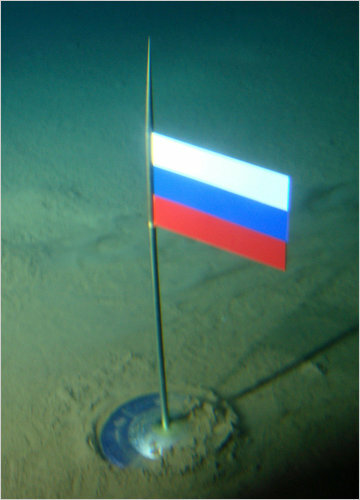 Mr. Chilingarov placed a Russian flag on the bottom of the ocean under the North Pole, claiming the area for Russia, in a 2007 polar expedition. But Russia is pressing ahead. The central decision opening the Russian Arctic easily passed Parliament in 2008, as an amendment to a law on subsoil resources. It allowed the ministry of natural resources to transfer offshore blocks to state-controlled oil companies in a no-bid process that does not involve detailed environmental reviews. 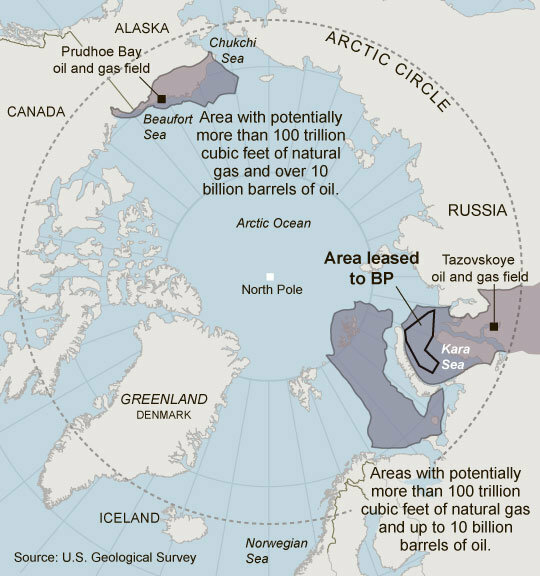 Until recently Russia regarded the Kara Sea, where BP and Rosneft intend to drill, as primarily an icy dump. For years, the Soviet navy released nuclear waste into the sea, including several spent submarine reactors that were dropped overboard at undisclosed locations. Rosneft executives say their exploration drilling will not stir up radiation. Andrew E. Kramer reported from Moscow and Clifford Krauss from Houston. A chart on Wednesday with an article about Russia’s eagerness to drill for oil in the Arctic Ocean gave an incorrect unit of measurement for estimates of natural gas reserves in the region. The shaded areas in the chart are believed to hold more than 100 trillion cubic feet of natural gas, not cubic tons. The unit of measurement was correct in an online version of the chart, available at nytimes.com/business. A district court in northern Sweden has ruled there is no reason why indigenous Samis there cannot sue the Swedish state for infringing on their fishing and hunting rights. The court rejected the argument of state lawyers that there were legal errors in the suit. The Sami parliament, which has only advisory powers, had argued that the Sami people should have a major influence over fishing and hunting rights, rather than the Swedish state. Speaking with Swedish Radio, Mattias Åhrén of the Sami Council, the organization representing the Samis across the Nordic region, says the ruling will have a major impact. The Norwegian sailboat “Berserk” sent out a distress call from the Ross Sea in the Antarctic on tuesday, february 22. at 05:20. After a short while the signal stopped, and nothing has beeen heard or seen of the “Berserk” since. At the time, one of the worst hurricane storms for years with winds up to 60 knots and waves 6-8 meters was sweeping the area. The boat with a crew of three is now considered lost, but a land party of two who tried to reach the South Pole on ATV’s, managed to make it to McMurdo Sound base and were flown to safety. New Zealand Rescue Central tells the NRK that the search is officially ended. The land party from the “Berserk”, Jarle Andhøy and Samuel Massie, arrive in Christchurch by airplane from McMurdo Sound. New Zealand and Norwegian Polar Institutes question the legality of the mission, others question the safety. Jarle Andhøy expresses shock and disbelief that the boat could have sunk, and dismisses claims of negligence of laws and security measures. “The cackling choir kan scream all they want. We have done our job 110 percent. Nature is nature, the sea gives and the sea takes, and that is something all the boys on board know very well,” Andhøy says. The Sea Sheperd vessel the «Steve Irwin» concluded their search for the three missing crew sunday, and thinks the crew must have sunk to the bottom of the sea together with the yacht. “These boys were adventurers who knew the risk of going into the Antarctic. When it is your turn to lay down your staff, there is no more beautiful place than here in the Antarctic, quartermaster Howie Cooke on The Steve Irwin told the NRK. 27.02. – The “Steve Irwin” is now out of the search. The “Steve Irwin” is now headed towards the Australian island of Tasmania, but it will search along the Antarctic coast, north of the last known position of the “Berserk”, the rescue center in New Zealand reports. “They have now finished their helicopter searches – this morning the last helicopter search was done outside of Franklin Island, one of the last meeting points agreed with the crew of the “Berserk”. Nothing has been found” NRK’s Asia correspondent Anders Magnus reports. Franklin Island was the last one of four meeting points agreed for the “Berserk” crew, and were investigated after “Berserk” captain Jarle Andhøy told rescuers of the meeting points. Andhøy and Massie arrived at the McMurdo base friday morning around 07:00 Norwegian time, and are waiting to be flown out. The crew of the “Steve Irwin” have now put their helicopter away after 18 hours of searching. Two other cruiseships sailing through the area will also continue the search. “Detailed searching is now scaled down, and even if the New Zealand Rescue Central say that they will not give up until all hope is lost, it is seems to be clear now that the boat might have sunk” Magnus reports. Mike Roberts, who leads the Maritime Rescue Central on New Zealand confirms that there will be no more helicopter searches on account of the pilot being exhausted. “We will contine searching for a few days. The only hope of finding survivors is if the boat is still floating. If you fall in the sea, even wearing a survival suit, you cannot survive more than two hours in the water, which holds 2 minus, Roberts say. The Russian scientific vessel, the «Professor Kromov», which helped earlier in the search, will also participate in further searches while it is in the area. The “Preofessor Kromov” was criticized by the crew of the “Steve Irwin” yesterday, who felt they had gotten very little support in the search. Sea Sheperd make it clear in a press release that the search is not over, and that captain Paul Watson intends to continue the search until they are asked to stop by the Maritime Rescue Center in New Zealand. “We have exhausted all options. Our search has been very thorough, and we have searched the whole area from the McMurdo sound to the Franklin Island three times” Paul Watson says in a press release. There is still a possibility the “Berserk” could have drifted north, something Sea Shepherd wans to investigate. Watson is quite shure, though that his crew has found what is to be found. In Watsons estimate, his crew has done a fine combed search of an area of about 4000 square kilometers. “The “Steve Irwin” is on it’s way out into the Ross Sea to search two of four contact points where the crew of the “Berserk” had agreed to meet”, Geir Mortensen at Hovedredningssentralen in Norway tells VG Nett. Mortensen says they have regular contact with the rescue central on New Zealand. The latest information says the “Steve Irwin” is headed north to continue the search. The «Steve Irwin» is now the only ship still searching for the Norwegian sailboat “Berserk” which has been missing since a distress signal was triggered from the boat tuesday morning. According to the New Zealand rescue central, the other ship participating in the search, the “Professor Kromov”, was relieved of it’s duties last night. An empty and damaged liferaft found in the Southern Ocean off Antarctica early today has been confirmed as belonging to the missing Norwegian yacht Berserk. The liferaft was found about 9am by a helicopter from the Sea Shepherd Conservation ship Steve Irwin, which had been searching for most of yesterday and for several hours today. Paul Watson, the skipper of Steve Irwin ordered a seaboat launched to recover the liferaft. The liferaft, the same make as that carried on the Berserk, had a torn canopy and was missing its first aid kit and survival knife. The National Rescue Coordination Centre in Wellington said there was no sign the liferaft had been occupied and it may have floated free from the vessel and not been released manually. Berserk landed its skipper Jarle Andhøy on the ice with another crew member as part of an expedition to the South Pole. Mr Andhoey confirmed to the rescue centre the liferaft was from Berserk. The Steve Irwin and a helicopter continued to search the area but no further trace of the missing vessel or the men had been found. The water temperature was about minus 12degC, meaning survival was only a few minutes. Friday morning, a raft was found by a helicopter from the “Steve Irwin”. Paul Watson, captain of the “Steve Irwin told the Herald Sun the Berserk had most likely sunk. “We will continue searching but the boat and debris would not have drifted further north than this raft,” he said. “In my opinion, the conditions at the time of the distress call presented some very serious threats to such a small vessel.” The weather in the area tuesday was extremely bad, with hurricane winds up to 80 knots. Waves as high as 8 meters were reported. The water temperature would have been about minus 12degC according to the Herald Sun, meaning survival would only have been a few minutes. The yacht had dropped two crew members off on the ice to trek to the South Pole. Watson said the duo had given him a idea of Berserk’s position but a search of about 90 percent of the area had found nothing. The search began after the yacht’s emergency beacon sent out a signal on Tuesday afternoon. It stopped transmitting after several hours. The two crew members on the ice are safe and well but still a day or two from McMurdo base. The weather in the area is now good, and Paul Watson of Sea Shepherd has had a helicopter in the air the whole day. “The sun is shining, unlike yesterday, which had a terrible storm, causing the New Zealand military vessel “Wellington” to abort and turn back. Yesterday we found a lifeboat that for a while was thought to be from the “Berserk”, but turned out to be one of three lifeboats the “Wellington” lost in the storm”, Watson says. The “Steve Irwin” will continue their search for at least another six hours. The area has now been thoroughly searched by helicopter, and further searches will continue further north where the boat might have drifted. According to Andhøy, Bellika had extensive experience with rough weather and the “Berserk” in particular, having joined Andhøy on two previous missions. Andhøy is concerned about hearing nothing from the crew on the boat for days, but is an optimist and thinks they might have sailed out to sea to be safer in the storm, according to this NRK article. “I have told the rescue central that Gisle (Tom Gisle Bellika) likes to go out towards open sea when there’s high wind and he has trouble. I hope this can be of help for the people searching for the “Berserk”, the captain told NRK. The land party consisting of captain Jarle Andhøy (33) and Samuel Massie (18) have used satelite phones to tell the world they are alright. Using ATV’s, they have reached the South Pole and are now heading back to meet the boat, which they did not know was missing. They expect to reach the coast in three to four days. The three people in the sailboat “Berserk” have still not made contact since their distress signal was triggered early tuesday morning. The weather has calmed down a bit, and two ships and a helicopter have been searching for the “Berserk” reports Nick Churchouse at Maritime New Zealand at about o6:00 thursday morning according to VG Nett. According to Churchouse, the weather conditions in the area are now quite good, with small waves and good visibility. The search parties will continue until 11-12:00 before evaluating what to do next. 09.23 : Wind down to 20 knots. Searches are expected to commence today. Sea Shepherd vessel (The Steve Irwin) is on it’s way to the area. They are carrying a helicopter. The vessel is expected to reach the area in 12-14 hours, but the helicopter can start ahead with the search a bit earlier. 11.20 Still hopes of helicopter search this evening or tonight. Two boats are in the “area”, but distances large. One Russian and one American ship. Rescue vessels from NZ had to re-tank. Calmer winds now. The distress signal was sent from inside the bay. Hope that was their rescue! According to Ocean News Explorers Web, the Russian vessel is the “Professor Kromov”. Status kl 12.55 : Winds are getting stronger. Nearest boat will arrive at the earliest in eight hours because of weather conditions. This ship has a helicopter on board! Dette skipet har helikopter om bord! Status 16.20: The boat is getting closer. Weather conditions still too poor to fly. New weather prognosis expected within two hours. So far reports say the weather is getting better. In that case, the helicopter can fly into the area before the boat gets there. “Distress calls rarely stop after such a short time.” According to Tore Hongset at Hovedredningssentralen (the rescue central in Norway), the “Berserk” is equipped with a distress call unit and two satelite phones. The distress call apparatus can be triggered manually by the crew, or it can go off automatically if the boat is covered with water. It is not known if the distress call was triggered automatically or manually. The distress signal is picked up by satelite and then transmitted to rescue centrals in the area. According to the Norwegian rescue central, an apparatus like this can transmit it’s signals for two to three days before the battery runs out. The signal from the Berserk stopped after about an hour. “Only rarely does a signal like this stop after such a short interval”, Hongset says and adds that there could be several reasons for the signal to have stopped. “The crew may have turned it off, the satelites could have problems picking up the signal, or the battery may have run out. But at this point, we know very little of what might have happened. 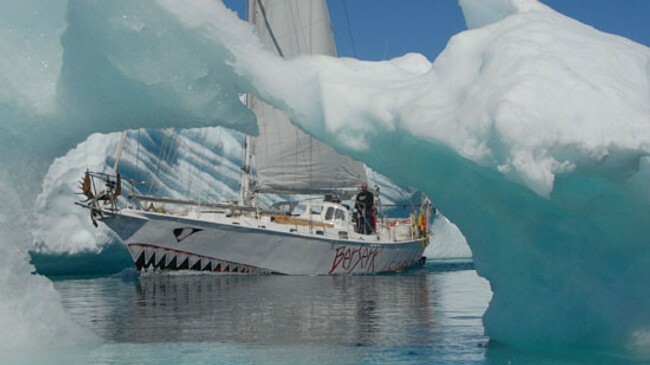 The “Berserk” is a 48ft (14m) steel hulled sailboat led by captain Jarle Andhøy who has produced several reality TV-series from his sailboat expeditions. He has led different crews of “wild vikings” towards the North Pole, around the Kola peninsula and through the Northwest Passage, often surrounded by controversy. Their current mission in the Antarctic was to follow in the footsteps of Norwegian polar explorer Roald Amundsen, and according to NRK wednesday, two of the crew has left the boat and the three remaining crew in the boat sent out the distress signals at 05:20 yesterday before radio contact was lost. It is now confirmed that the land party was captain Jarle Andhøy (33) and Samuel Massie (18). They have now been in touch with the rescue centrals and are doing fine, expecting to reach the coast on their ATV’s in three to four days. Rescue crews on New Zealand are ready with airplanes and helicopters to join the search for the “Berserk”, NRK reports wednesday morning. A New Zealand marine vessel in the area had to abort it’s search and turn back because of the bad weather, which has remained unchanged since wednesday morning. “The weather is very bad and changing, with high waves (up to eight meters) and poor visibility”, rescue leader Øyvind Aadden reports to the NRK wednesday morning. According to the Rescue Coordination Centre New Zealand, the “Berserk” was 18 nautical miles (33 km) north of the Scott-base when they sent out the distress call at 5:20 tuesday morning. Until it was safe to go into the Ross Sea with boats, rescuers were collaborating with bases in Antarctica to see if it was possible to start searching with airplanes. Fertilizer giant Yara says it is favourable to ship ore tailings from its coming Sokoli mine in Finnish Lapland to existing concentrator plant in Kovdor, just cross the Russian border. Yara fertilizer plant and phosphate rock mining in Siilinjärvi near Kuopi in Finland. The plan is to start mining in 2014-15. Technical and economic studies are now underway, but Yara Soumi Oy says already that building its own enrichment plant in Sokoli will be too costly. – It make sense to use the existing concentrator plant for apatite, located only 50 kilometres away, instead of building a new one, says Eero Hemming, coordinator for the project in a press-note posted on Yara Suomi Oy’s own portal. The concentrator plant in question is located in the Russian mining town of Kovdor, near the border to Finland on the Kola Peninsula. Hemming says another reason to go for the Russian plant is to make less impact on the environment in the area near Sokli. The up-coming mining of phosphate and niobium in Sokli has triggered protests from an ad-hoc environmental group. The group Save-Sokli claims the by-products make mining in the area extremely problematic. Sokli is located in Savukoski, between the Urho Kekkonen National Park and the Värriö National Park, said to be the most significant wilderness camping area of Eastern Lapland. The mines will also influence on migration and grazing area of reindeers of Kemin-Sompio, the largest reindeer herdsman cooperative in Finland. By shipping the ore to Russia for concentration, Yara hopes to minimize the environmental impact in Finland. Yara is now proceeding with the Kovdor plant’s owner EuroChem to find solutions for upgrading the ore at the existing plant cross the border from Sokli. Kovdor is Russia’s second biggest producer of apatite concentrate. The regional news portal Barentsnova reported earlier in February that Murmansk governor Dmitri Dmitrienko recently approved a long-term program to modernize the plants in Kovdor and to construct production facilities for several other minerals. According to Yara, ore mined in Sokli can be transported to Kovdor either by tube or train. Yara has long history of doing business with the fertilizer industry on the Kola Peninsula. The company has bought apatite minerals from both the mines in Kovdor and in Kirovsk. The minerals are shipped from a special designed port in Murmansk to Yara’s fertilizer plants in Glomfjord and Herøya in Norway. The mining plans in Sokli are welcomed by locals in Finnish Lapland. The mine will create jobs for 110-150 people, and even more in the construction period. Yara will make a final decision on the mining and processing during 2012. Cooperates with Gazprom on Shtokman gas – wants cooperation with Rosneft on Barents oil. French petroleum major Total is in talks with Russia’s oil major Rosneft on joint projects in the Barents Sea, General Director of Total in Russia Pierre Nergararyan told reports in Moscow on Wednesday. Nergararyan told RIA Novosti that Total want partnership with Rosneft on both the continental shelf in the Barents- and Black Seas. Total and Norway’s Statoil are partners with Gazprom in Shtokman Development AG, supposed to announce a decision on possible investments for the huge gas field in the Barents Sea next month. Last October, the Russian Government granted Rosneft and Gazprom five new licenses to oil and gas fields in the Kara Sea and Barents Sea. In December, BP and Rosneft said they had formed a strategic partnership for development of offshore oilfields in the Kara Sea, east of Novaya Zemlya in the Russian Arctic. Today I feel lucky, having stumbled onto some related science. The population density of northern Minnesota moose has been falling for years and bull moose are decreasing in proportion to cow moose. No, it’s definitely not a poaching problem; nor is it a human hunting or wolf-predation caused fall off (see below for some data). There is, however, a potential correlation of the long term Minnesota moose population collapse with climate change. Here are some brief (out of context) excerpts from a presentation made recently that summarized research into possible causes of the observed decline in Minnesota’s moose population. Source: Presentation “Minnesota Moose” by Mark S. Lenarz and Erika Butler Minnesota DNR, Division of Fish and Wildlife Wildlife Research Unit. Moose have an upper critical temperature of 14º C in the summer and -5 º C in the winter (Renecker and Hudson 1986). Moose increase their metabolic rate when these thresholds are exceeded in an attempt to maintain core body temperature. Non-hunting mortality was correlated with temperature indices, both seasonally and annually and these temperature indices have been increasing over the last 50 years. If increasing temperatures are the cause for the decreases in survival, the decline of the northeastern population will take place even more rapidly. From the same presentation, here are summations of mortality causation and population trend. Note: I am not personally suggesting that Minnesota moose are dying off mainly because they’re too hot, although, not being an expert, I can’t exclude the direct significance of heat stress, nor can I weigh the impacts on moose of changed seasons. The best thing to do if you are interested in understanding this is to dive into the full presentation and give it some consideration before you comment. What I am saying, in general – regarding surrogate indicators of climate change – is that a bear crawling out of its den after a two-day Wisconsin February warm up is not a behavior that I’ve ever heard of before. There’s no evolutionary advantage for the bear to then fall asleep in the snow where he is vulnerable to predators. Sure…it happens in March or April; but, a February den emergence signals a change in nature. Moose evolved to live in a boreal-like forest characterized, in part, by their fitness inside a certain band of seasonal temperatures. When these thermal optima shift upward, individual animals may migrate north and/or the overall moose population will decline. It is the nature of living things. Otherwise we’d have tapirs in Oklahoma and alligators in Maine. So, I’m sticking with my intuition on this subject. What’s good for the Tea Party is good enough for me. Bears should be in their Wisconsin dens in February and Moose should flourish across northern Minnesota, assuming human-caused habitat changes and disease are shown not to be likely causes of the crash, for example. All there is left to debate is whether and to what extent we humans are causing the climate to change. If I lived in Minnesota and liked to hunt I would want to get to the bottom of this and would offer what ever support I could to the researchers studying the population crash. Same if I were a company making a rifle capable of downing a bull moose. Can the name Rudolph the Red Nosed Reindeer be used interchangeably with Rudolph the Red Nosed Caribou? Google the words “reindeer” and “caribou” together and you’ll see that they are often used to refer to the same animal. In this week’s Discovery News story concerning Christmas trees and reindeer, I use both words, noting that reindeer are called “caribou” in North America. The longer explanation may be much more complex, however. He explained that one represents a lineage that was pushed south during the last glaciations and survived in what is now the United States. The other survived either in northern Asia or in a western North American refuge before it colonized, or recolonized, the Arctic regions of North America. Animal experts refer to this latter group as the “migratory barren-ground form.” Not as catchy as “reindeer,” but more descriptive. The bottom line is that some animals called “caribou” now may be what people in Finland and other countries refer to as reindeer, and some may not. There may even be yet another species in the mix. Additional research will hopefully solve the present puzzle. There’s a serious aspect to such research beyond word play, as some reindeer/caribou herds are nearing extinction, while others are doing OK.
“The largely non-migratory woodland caribou and mountain caribou forms are classified as threatened, though some herds are classified as endangered and some as ‘special concern,'” Wells explained. More accurate taxonomy will help to better identify the animals of highest priority for conservation. For now, though, unless you are a proper name purist, Rudolph the Red Nosed Caribou works just as well as his better known name. Where is the Barents oil? Statoil drills yet another dry well in the western part of the Barents Sea. Geologists, petroleum companies and politicians are highlighting that the Arctic is an area of high petroleum resource potential. US Geological Survey says nearly a quarter of the world’s undiscovered petroleum resources lie in the Arctic. Norwegian Petroleum Directorate announced on Friday about yet another dry well. The well was drilled by Statoil 145 kilometres off the coast of Finnmark in the western Barents Sea. The well is in the same area as the Snøhvit gas field. The well was drilled from the platform Polar Pioneer to a vertical depth of 2887 meters below the sea surface. It has now been permanently plugged and abandoned, according to the Petroleum Directorate. Polar Pioneer will now proceed to another production license in the Barents Sea. In early January, the oil company Eni Norge announced that they had drilled a dry well just west of the Goliat field, also in the western part of the Barents Sea. In December 2010, Shell said its exploration drilling at the Dalsnuten prospect in the Norwegian Sea proved unsuccessful. BarentsObserver reported last autumn that there are large uncertainties about petroleum resources in the delimitation line area in the Barents Sea. Professor Jan Inge Faleide with the Insitute of Geology at the Univeristy of Oslo said there were good oil and gas fields in the southwestern Barents Sea, but that was five to ten million years ago. – Much of the petroleum resources that might have been there is now gone, Faleide said. The Nordic and Baltic countries meet February 22 with Russia and the EU, as well as representatives from the Arctic and Barents regions, to tackle issues such as the pollution of the Baltic Sea, improvement of the Northern Axis transportation corridor linking Europe and Asia, as well as energy policy and other matters of common concern. Politicians from the Nordic and Baltic region as well as the Arctic and Barents area meet with representatives from the Russian Duma and the European Parliament for the second Northern Dimension Parliamentary Forum on February 22-23. The Forum will take place in Tromsø, Norway and is hosted by the Norwegian Parliament. Politicians present include representatives of the Saami population and the indigenous peoples of the Arctic region. The Northern Dimension Partnership includes four pillars: environmental issues, health and social issues, transport and culture. Negotiations will take place in all four areas, resulting in policy recommendations for the relevant national governments of all the parties involved. The first Northern Dimension Parliamentary Forum was hosted by the European Parliament in 2009. The Forum has been instituted to improve cooperation and development in Northern Europe and the Arctic.